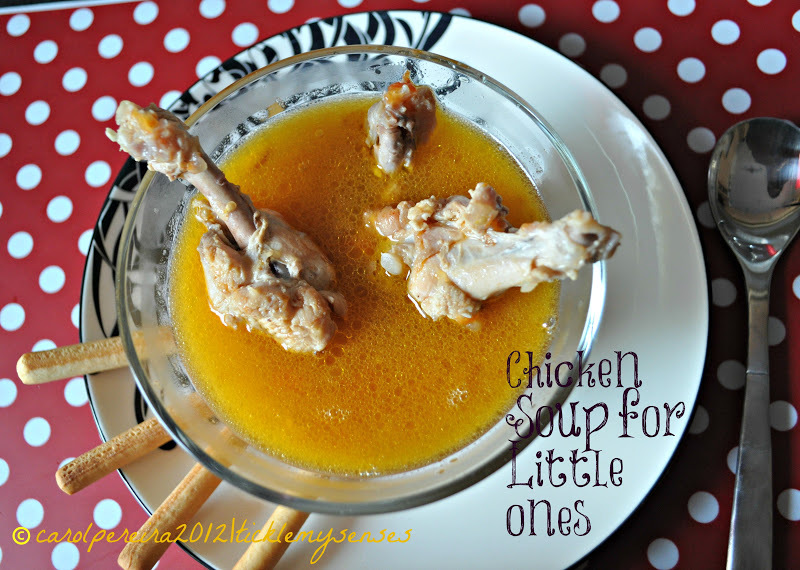 Tickle My Senses: Comforting Chicken Soup for little ones. It is this " Hunger strike" phase that actually drives me mad ;) as well as makes me ever so determined to find him dishes or foods that will actually tickle his fancy and his appetite. This recipe for one, is life saving, in that it truly works every single time. 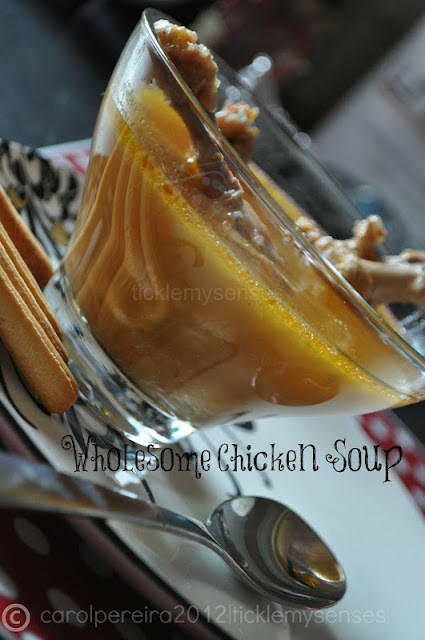 I learned to make this simple chicken soup/ broth from my mom. This is my definition of honest food, that is flavourful and absolutely delicious. Baby A thoroughly enjoys this soup, be it a high fever, a blocked nose, or loss of appetite, he most often can't stop licking his lips and going hmmmmm after every spoonful. Hubby loves it too when he is feeling poorly, just a good sprinkling of freshly ground black pepper, it is magic. Is it just an old wives tale, or does chicken soup really have some healing properties to sooth and make you feel better? 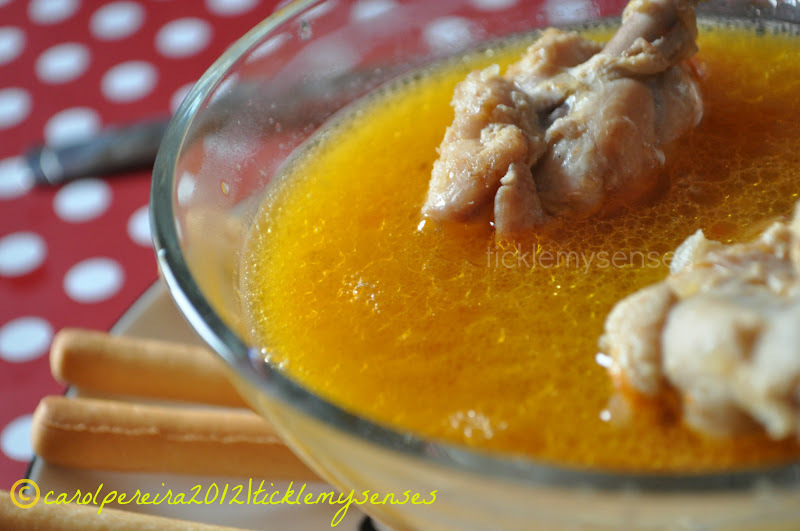 Well, Chicken soup has been scientifically proven to have several properties that make it useful in the treatment of certain illnesses. 1. As it is all fluid...it fits the “Plenty of fluids” bill that doctors strongly advice when you are ill.
2. The warmth and the salt in the soup does have a way with bacteria in the mouth and throat. 4. The lean protein in chicken and nutrients from added vegetables works to renergise the body when energy reserves are low. 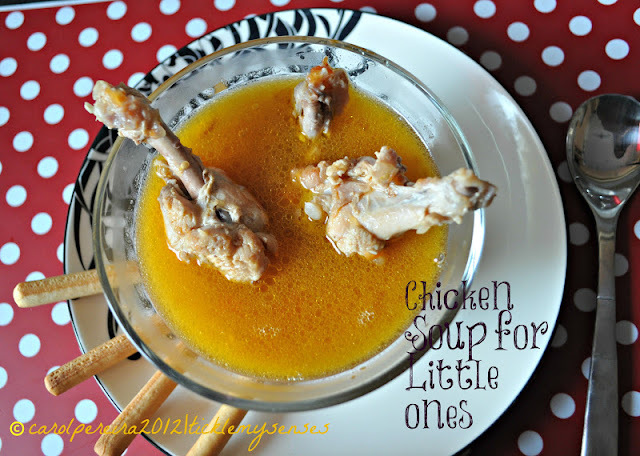 Watch your "little ones" bounce back to their witty selves with a warm comforting bowl of this nutritious and yummy chicken soup. Chicken: 4-5 drummettes (the small leg connected to the wing) You could use any other pieces. Onion: 1 small, chopped fine. 1. In a pressure cooker take ghee, when hot add crushed cardamom, clove and cinnamon fry for a few seconds till aromatic, then spoon out spices. 2. Add 1 tbsp of the chopped onion to the spiced infused oil and fry well till brown. Then add the chicken drummettes, and fry for a couple of minutes to seal the surface of the chicken, add the remaining chopped onion, tomato, carrot stick and celery stick, hot water and a few pinches of salt. Close the pressure cooker and cook the chicken for 5 whistles. When done turn the heat off, allow the pressure to drop. 3. Open the cooker. Spoon out the carrot, celery. You could chop up carrots into tiny pieces and put back into soup or leave out. 4. Taste the soup for seasoning, squeeze over a few drops of lemon juice. Pour the soup into a cup. 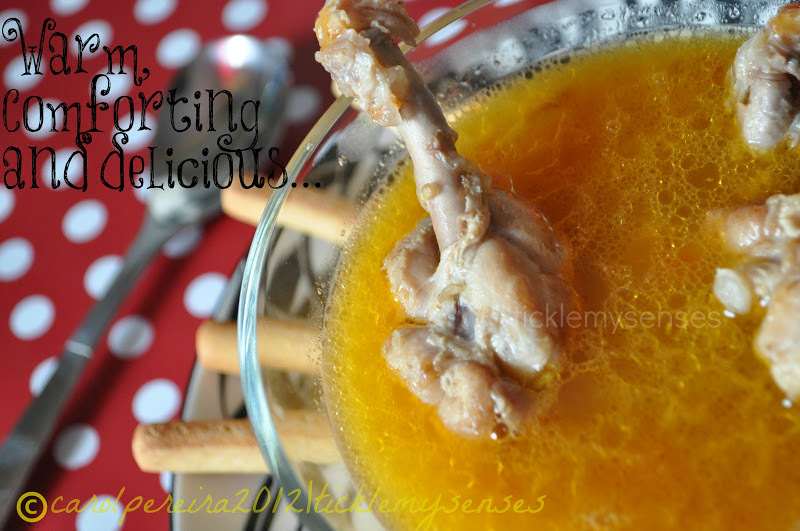 Serve warm along with 2-3 chicken drummettes and a slice of wholegrain toast, or a couple of breadsticks. 1. Alternatively you could thinly shred the chicken off the bone and add to the soup. I tend to leave the meat on the bone as Baby A enjoys it that way. 2. Any leftover chicken drummetes can be allowed to cool down completely, before placing in an airtight container in the fridge, these drummetes can be shredded and used to make a chicken sandwich, or a topping for pizza the next meal.